The Capitol (1793) was designed as the centerpiece of the District of Columbia. Its location, on Jenkins Hill, was deliberately chosen because it allows the structure to appear to glow at sunset. In 1855 a dome and a statue for its top were commissioned. The sculptor of the statue sent the cast to the US. He died and it appeared impossible to disassemble the statue for casting. James Reid, an enslaved foundry worker, solved the problem and the statue, “Freedom”, continues to crown the dome. For more than 200-years “The District” has been the pulse beat of the country and the keeper of the nation’s history and cultural memory. 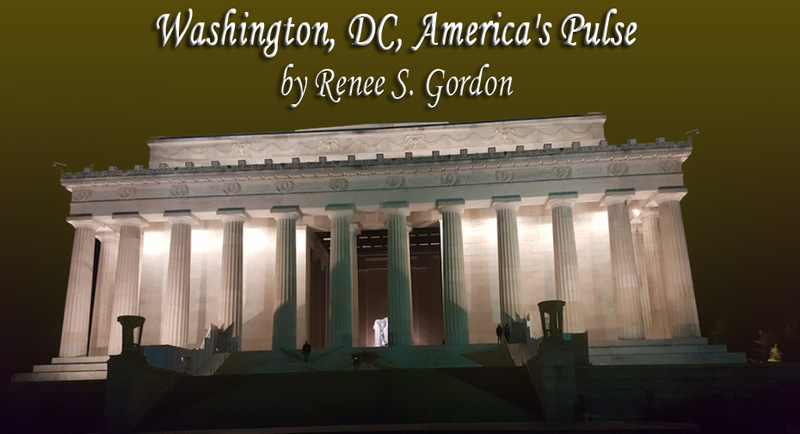 Festivals, protests, marches and other events that altered history played out here. The more than 300-acre National Mall was designed to serve as a main thoroughfare. Today it provides access to the most viewed and visited monuments, museums and Smithsonian sites. 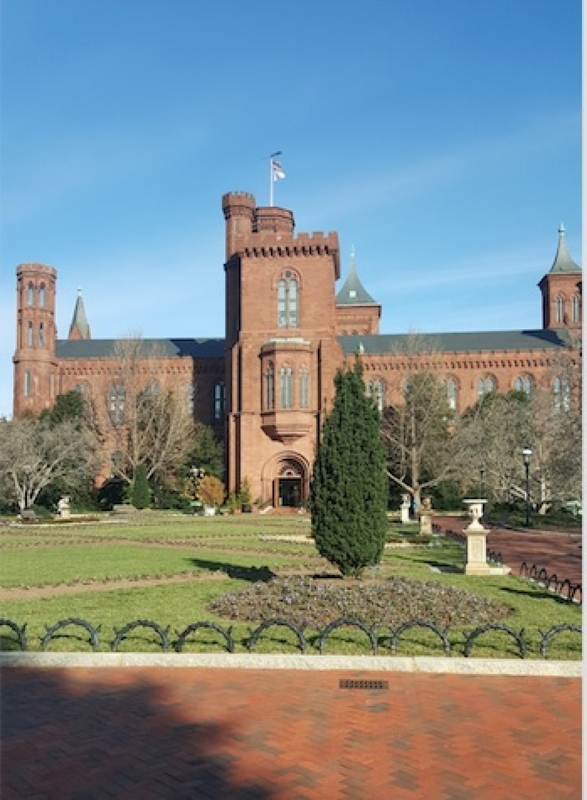 As the Mall is referred to as the nation’s front yard the Smithsonian Institute is considered the nation’s attic. It's the largest museum in the world with an additional zoo and research sites. James Smithson, a Scotsman who never visited this country, willed more than $500,000 in 1829 to establish the Smithsonian. 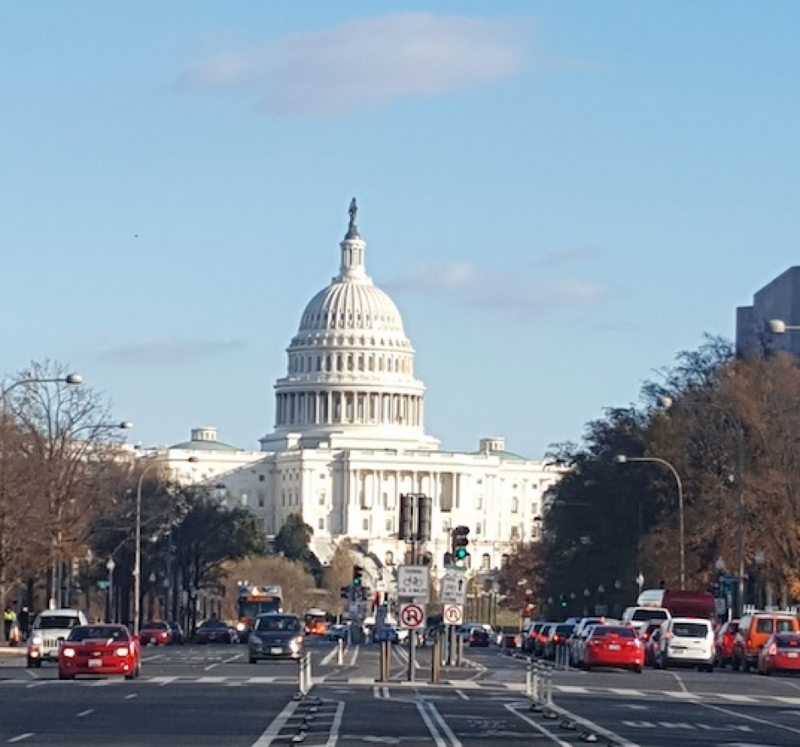 Taking an Old Town Trolley tour is a great way to see as much as possible and cover long distances while visitind the DC. There are guided tours, begin at 9 am that allow passengers to hop-off and on the trolley at 25 stops. There are red and blue routes that cover both The Mall and Arlington National Cemetery. The evening tour, Monuments by Moonlight, is a wonderful way to view the Illuminated city. One of the greatest benefits is that visitors can explore sites that are often under-appreciated. The National Museum of African Art is dedicated to the traditional arts of sub-Saharan Africa. It was established in 1964 and became part of the Smithsonian in 1979. The museum’s collection representes 900 different African cultures. One exhibit, “Good as Gold: Fashioning Senegalese Women” focuses on the cultural significance of gold; its mining, trade and symbolism of power, beauty and self-expression. You will gain a new respect for the postal service after a visit to the National Postal Museum. Exhibits feature the history of postage stamps and a timeline of the postal service in America through interactives, videos, artifacts and text. Visitors can enter a train mail car, walk the original mail route and examine artifacts from famous crimes involving the postal service including the Unabomber’s handcuffs. Currently on display is “John Lennon: The Green Album”. 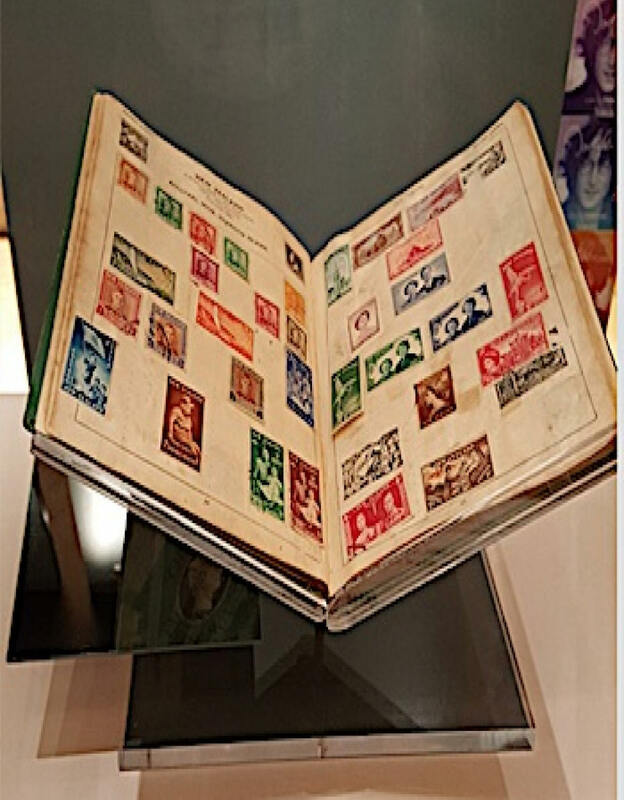 As a boy Lennon collected stamps and his album contains 565 stamps on 150 pages. This is a hidden treasure! 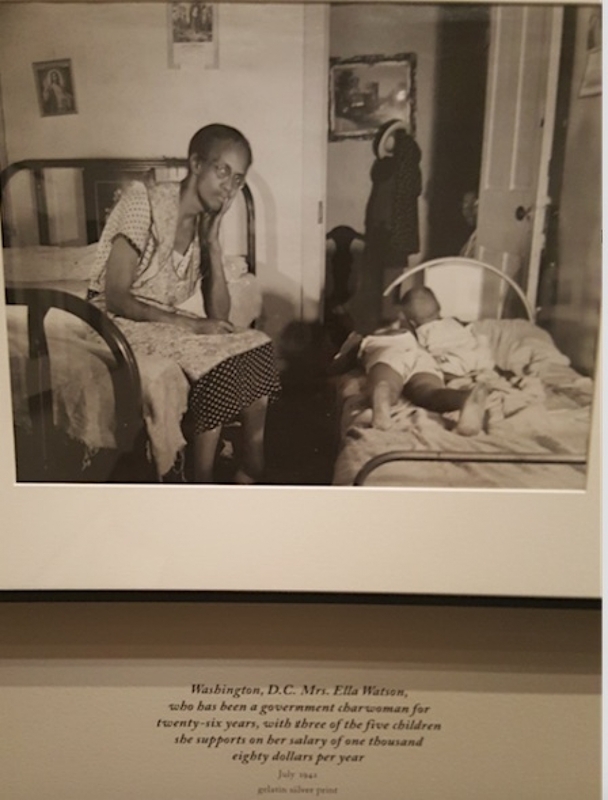 “Gordon Parks: The New Tide, Early Work 1940-1950” is on exhibit in the National Gallery of Art until February 18th. His works are a window into an era as is Dawoud Bey’s “The Birmingham Project” in an adjacent gallery. The gallery is housed in two buildings and has a collection of European and American Art from the Middle Ages to the present. The Korean War Veteran’s Memorial recognizes the soldiers who fought there. The war was the first without racial segregation and the 19 sculptures when reflected on the wall add up to 38 representing the 38th parallel. There are twelve white, three African American, two Hispanics, one Asian and one Native American sculpted soldiers. Nearly 10,000 women served in Vietnam and their service is commemorated here at the 1993 Vietnam’s Women’s Memorial. Located near the Vietnam Veteran’s Memorial Wall the 6’8” bronze sculpture depicts a seriously wounded soldier assisted by three servicewomen. The National Portrait Gallery displays portraits of noteworthy women and men including the U.S. Presidential portraits. 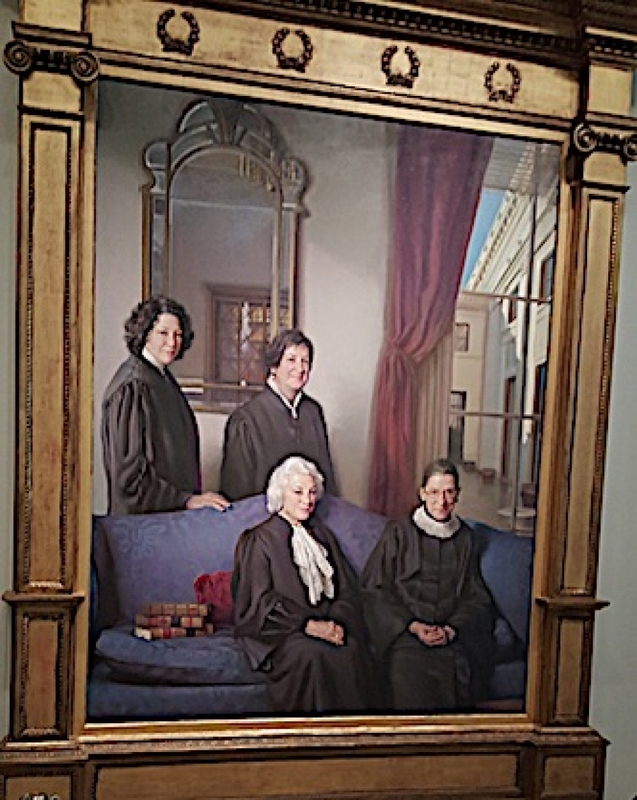 One highlight of the collection is Nelson Shanks life-sized painting, The Four Justices, of female Supreme Court Justices O’Connor, Kagan, Sotomayar and Ruth Bader Ginsburg. 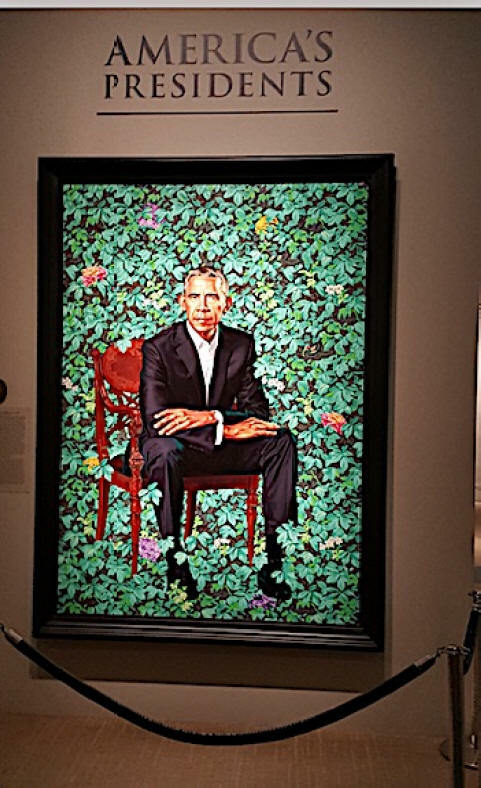 Two of the most famous portraits are those of Michelle Obama by Amy Sherald and Barack Obama by Kehinde Wiley. I suggest you be there when the gallery opens and head straight to the third floor for comfortable viewing. 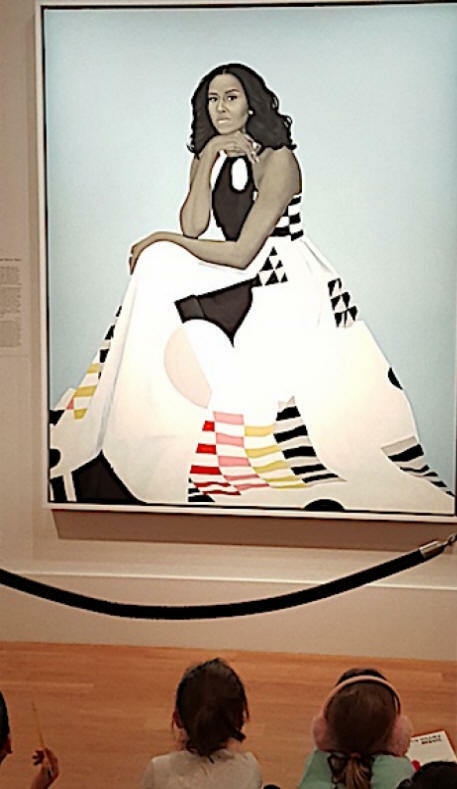 Do not miss the symbolism in Michelle’s portrait, especially in her patterned dress.